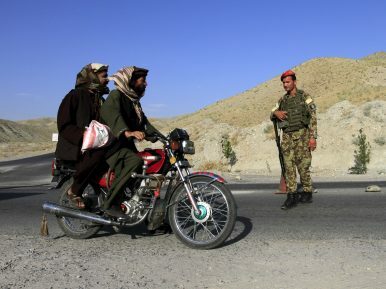 An Afghan National Army soldier (ANA) watches a motorcyclist at a checkpoint on the outskirts of Jalalabad province (June 29, 2015). The visits from Taliban delegations to Shiite Iran, a country that once came to the brink of a full-fledged war with the Taliban regime and that continued supporting the anti-Taliban Northern Alliance throughout the 1990s, will be a source of concern for the long time Taliban supporters such as Sunni Pakistan and Sunni Wahhabi Saudi Arabia. The Taliban and Iran established contacts while Mullah Akhtar Muhammad Mansour was leading the group. Mansour was also believed to have established contacts with Russia, a country that once strongly opposed the Taliban regime and provided moral and material support to the Northern Alliance. At the same time, Pakistan is also coming closer to Russia. During the peak of the Afghan war, Pakistani mullahs, fully backed by the official media, used to call Russians “Sur Kaafar” or “red infidels” (literally) to foster the hatred of Russians among the Afghan refugees and their Pakistani hosts to win maximum support and recruit volunteers on larger scale for the American and Saudi-sponsored jihad. Times have changed, however. In November last year, we witnessed Russian commandos conducting joint exercises with the Pakistan Army. Earlier, then-Pakistani army chief General Raheel Sharif had visited Russia, while Russian top officials had paid several visits to Islamabad. On the contrary, we see very few diplomatic contacts between Pakistan and the United States, the two long-term allies in the region. However, U.S.-India contacts are quite visible. At the same time, India has increased its proactive role in Afghanistan, which is seen as a source of concern in Pakistan. With the United States and Russia rivalry going on the top in the Middle East and Eastern Europe, it is unlikely that the two major powers will come to terms in Afghanistan in the near future. That means the shifting of alliances in the region will pave the way for different armed groups and warlords to continue getting support from their various foreign backers. Mullah Rauf Khadim was the first among Taliban renegades who joined the ISKP when it was established in early 2015 under the leadership of an ex-Tehreek-e-Taliban Pakistan (TTP) stalwart, Hafiz Saeed Khan. Hailing from Afghanistan’s volatile southern zone, Khadim was believed to be an influential Taliban leader. He was the first among the ISKP leadership to be killed in a drone strike in Helmand province of Afghanistan. Defections among the Taliban’s mid-ranking commanders and foot soldiers have also been reported in eastern Afghanistan, where the ISKP is still holding ground despite immense pressure from the Afghan and international troops as well as the Afghan Taliban. As the Afghan and Pakistani authorities are struggling to bring the Afghan Taliban to the negotiating table, it is feared that the hardliners among the Taliban, who are not happy with peace talks with the government, may likely switch sides to the ISKP. The same concern is widespread among the Afghan Taliban leadership, who believe that convincing their foot soldiers and mid-ranking field commanders to end the violence is a hard if not an impossible task. If forced to end fighting, these commanders and fighters may prefer to switch sides to the ISKP. For years, the Taliban leadership indoctrinated their foot soldiers on their opposition to girls’ education, male and female segregation, and Sharia as the constitution of Afghanistan. Now they find these same ideals upheld by the Islamic State. By the same token, the Central Asian jihadists, though only a few hundreds in number, may also shift allegiance to the ISKP before sensing any change in Taliban attitude towards ending the decade-long jihad. Many of the IMU (Islamic Movement of Uzbekistan) members have already switched over the ISKP, whose leadership despise the Taliban’s pragmatist policy of non-interference in any country. The ISKP, on the other hand, are strongly supporting global jihad. While decades of ongoing war in Afghanistan have forced the vast majority of the literate and even semi-literate population to support durable peace in their country, frustration with weak governance, widespread corruption, financial disparity, lawlessness, and distrust in the country’s legal and judicial system are few of the major issues that may drift the youth toward the Islamic State of Khorasan Province (ISKP), whose propaganda in the country’s educational institutions in general and those of the eastern and central zones in particular, is stronger than any other militant outfit. In the same token, despite Pakistan’s strong action against the “bad” Taliban and shattering of its command and control structure in the tribal areas on the Afghan border, influential individuals, political, religious, and sectarian groups as well as vested interests still carry the threat of sparking a trouble in the region in the longer run. Militant organizations always try to take advantage of weaker state control on matters relating to governance and security. In Pakistan, despite pockets of support or the presence of sympathizers, the ISKP has so far failed to exhibit its presence as an organization. However, across the border in Afghanistan, the group has a visible presence in areas where the state has weak or no control. Apart from the Afghan security forces, the international presence in Afghanistan is so far a major hurdle for the expansion of ISKP. However, with the withdrawal of international troops, Afghanistan may witness a surge in ISKP activities and the group’s expansion to neighboring districts and provinces in the country’s east. In the north, the weaker Central Asian states could be another breeding ground as numerous reports suggest that the defeat of Islamic State in Syria may force its Central Asian fighters to return back to their countries or the neighboring Afghanistan to foment trouble in their respective areas. The jihad-era warlords, who were swept and almost subdued by the Taliban following their taking over of Kabul in 1996, once again emerged as powerful actors following the overthrow of Taliban regime in late 2001. Over the past fifteen years, these warlords have amassed more power and many of them are unchallenged rulers in their respective districts and provinces. These warlords care more about their personal and group interests than the interests of Afghanistan as a whole. One example is the powerful governor of Balkh province Atta Muhammad Noor, aka Ustad Atta. A former commander of Jamiat-e-Islami, Noor is the unchallenged boss of his province and even the elected president of Afghanistan hesitates to call him to the center or transfer him to another province. On the positive site, Noor has so far managed to keep the province calm and safe from Taliban or any other militant group. Apart from Taliban and other armed groups, the presence of such powerful individuals is a serious challenge to the state’s authority. As discussed above, this weaker state authority is providing space for armed groups to carry forward their agendas. The drug mafia has also expanded its network and strengthened its roots in all parts of Afghanistan. These vested interests are providing money to armed groups to ensure safe routes for narco-trade. Due to their huge monetary resources and vast network, including strong connections inside the two houses of the Afghan parliament, the provincial councils, police, and other governmental offices, the drug mafia can create law and order situations wherever they see their interests at stake. Insiders believe the taking over of Kunduz province in November 2015 by the Taliban had the backing of the drug mafia. Insecurity in Helmand, the top poppy-producing province in Afghanistan’s south, has the blessings of powerful drug lords. The 15 year history of militancy in the AfPak region shows that money plays a greater role in buying the loyalties of warlords, tribal elders, and militant leadership. It was thanks to their huge coffers that Osama bin Laden and his Arab supporters stayed in Afghanistan as guests. The same guests used their money to win over tribal elders following the overthrow of Taliban regime in late 2001. Although it does seem to be a distant possibility, especially at a time when the Islamic State in Syria is facing a visible defeat and its huge financial resources are depleting, the ISKP may win over key leaders, elders, and even government officials if they began to receive huge sums of money from outside sources. So far, the group continues to survive on donations from Gulf countries and extortion of money from areas under their sphere of influence. Daud Khattak is Senior Editor for Radio Free Europe/Radio Liberty’s Pashto language Mashaal Radio. Before joining RFE/RL, Khattak worked for The News International and London’s Sunday Times in Peshawar, Pakistan. He has also worked for Pajhwok Afghan News in Kabul.